Give pan seared pork chops a twist. 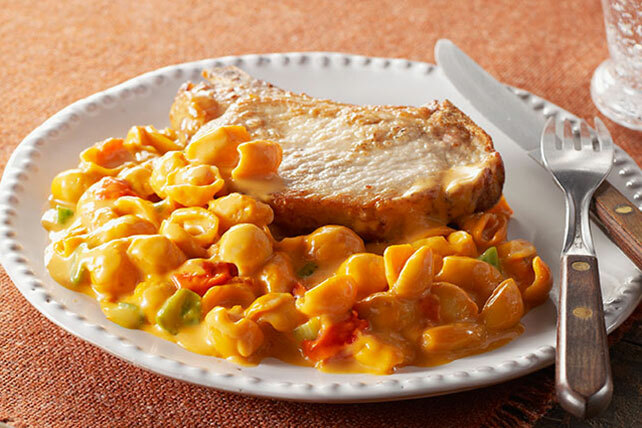 Try one-pan Pan Seared Pork Chops & Mexican Shells recipe. In just 35 minutes you'll have the perfect weeknight dish. Heat oil in large skillet on medium-high heat. Add chops; cook 5 to 6 min. on each side or until done (145°F). Remove from skillet; cover to keep warm. Add salsa and water to skillet; bring to boil. Stir in Shells and peppers. Cook on medium heat 10 min. Stir in Cheese Sauce; top with chops. Cover. Simmer on low heat 5 min. or until heated through. Prepare using 4 boneless pork chops (1 lb. ), 3/4 inch thick, and cooking 6 to 8 min. on each side or until done (145°F). Prepare using 4 small boneless skinless chicken breasts (1 lb.) and cooking 5 to 7 min. on each side or until done (165°F).